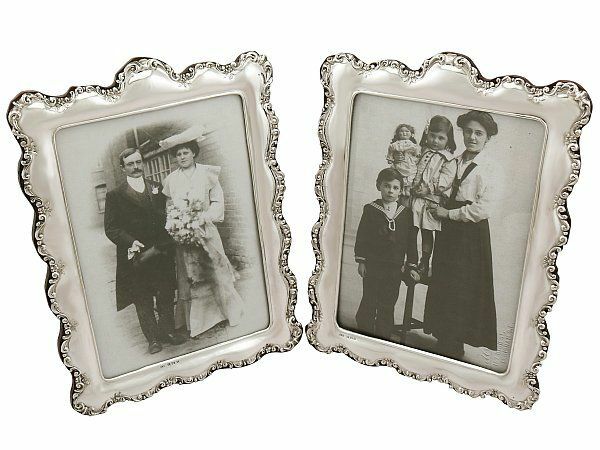 These exceptional antique Edwardian English sterling silver photograph frames have a rectangular shaped form with a rounded rectangular window. The subtly convex surface of each silver frame is plain and embellished with impressive embossed scrolling leaf designs to the undulating shaped rim. These Edwardian silver photograph frames are fitted with the original oak wood backs and hinged struts, each secured with two swivel catches. These impressive examples of antique silverware are fitted with removable glass panels. This impressive composite pair, crafted by Henry Matthews, bear different date letters; one was crafted in 1906 and the other in 1909. These antique Edwardian silver photograph frames are an exceptional gauge of silver for their type, exceptional quality and in exceptional condition. The frames have been professionally polished and are in presentation condition. The oak wood backs have been professionally polished by a cabinet maker. The embossed decoration is all very sharp. Full hallmarks struck to the surface of each frame are all very clear. Height of internal window 21cm/8.3"
Width of internal window 15.2cm/6"